In The three brides, the young woman in the middle is literally and figuratively central. From her innocence she has to choose between the spiritual life, symbolized by the Madonna-like woman on the left, and the earthly, sensual life of the woman on the right, who represents evil with her facial expression and the string of skulls on her chest. 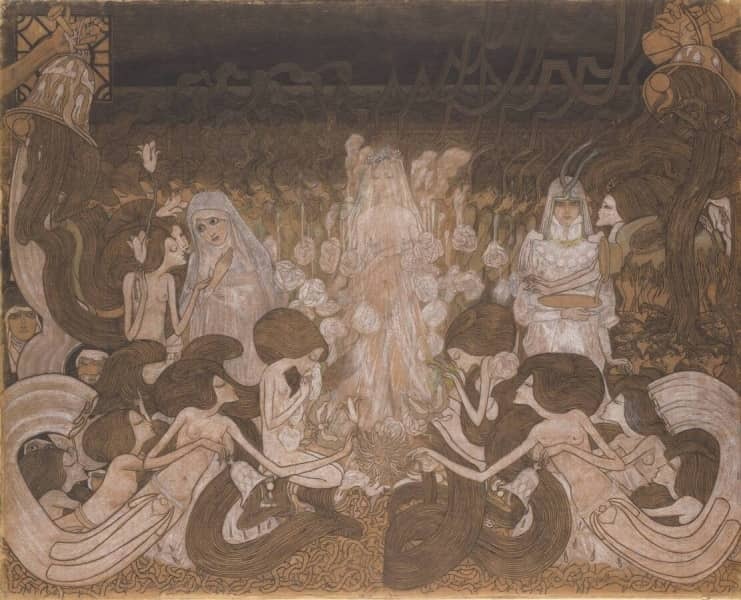 In the foreground, virgins bring bells, lilies and butterflies, as an expression of ‘the birth of the eternally feminine here on earth’, as Toorop writes. In the background a choir sings about the dangers and difficulties that still await the young bride in her life. Jan Toorop made this drawing in the spirit of symbolism. In their work, the symbolists focus not on the visible, physical reality, but instead use depiction, colour and line to represent mainly the psyche of mankind, his dreams, thoughts and desires. In Toorop’s words, his drawings are about a choice either for the ‘highest consecration and the highest abstinence’ or for a ‘deep carnal, false, material desire’.